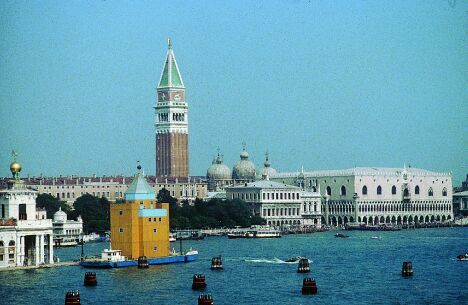 Many people think that the large pleasure boats that sail up the Adriatic to Venice cannot be moored in the city. To learn more, we asked Sandro Trevisanato - the Venetian attorney we often mention in "Nautica" because he handles problems associated with pleasure craft in Venice. He is currently the president of the Venice Passenger Terminal, the franchisee for the Venice Maritime Station and its 4,000 metres of wharves. These are the same quays where the many Italian and foreign maxis that arrive in Venice every year ask permission to dock. So then, is there space for maxis in Venice? There certainly is. Just make sure you ask for it in good time, directly to VTP - telephoning numbers 0412403030, fax 0412403090 or mobile 3357272725 - without middlemen and at the price of 12 Euro per linear metre, giving the name of the yacht, the overall length, the date of arrival and the expected duration of the stay. Is it possible to also book from the USA, from Sweden, from Britain, etc? Certainly. It's a service that VTP has been offering since 1997, right from its establishment, and which the progressive increase in requests has persuaded us to rationalise and develop. How come this possibility is not very well known? I'm amazed at this surprise! But maybe it's our fault, that we haven't carried out any promotion on what has been one of the institutional activities of VTP since 1997. In practice, we have considerable spaces for boats of 20 metres and more, also for pleasure craft up to 140- 150 metres. There's a string of names of prestigious yachts that have been our guests. Some of these have had the fortune of being moored at Riva Sette Martiri, with a spectacular view of the "Bacino di S. Marco". You just need to book in good time, to the numbers mentioned before. The priority is the date of the request. There's also space for the numerous maxis currently being built in Italy, which haven't yet found a mooring place. With a bit of planning, the problem can be sorted by placing it in the hands of Cap. Giuseppe Fabbro, Managing Director of Venezia Terminal Passeggeri. Access is gained to the Marina via sea and directly by land, from the Mestre bridge, before arriving at Piazzale Roma and Venice. And this is important for taking on board both supplies and passengers or crewmembers. We manage a thousand car spaces, so there's always a place, just as for the boats. What's the message that you'd like to leave with the readers of "Nautica Magazine"? The boat owner or skipper of a maxiyacht, will find an extremely serious and precise interlocutor in VTP - a company with largely public capital but perfectly organised -, which does not seek to take advantage but wishes to offer a service that will be well remembered, together with the beauties of Venice. Building a reputation through word of mouth of the user is our winning card.